Andes ‘Battle of the Bands’ – Saturday! | Andes Works! A Music Competition with Cash Prizes! Jezz Harkin and Terry Doyle from WIOX Radio will be broadcasting LIVE! Six Bands have signed up to perform Rock / Alternative Rock/ Thrash Metal/ and all acoustic! Held at the Andes Fire Department outdoor pavilion on Tremperskill Road, Andes, NY. BBQ & drinks available. (No Alcohol) Rain or Shine – we’ve got cover. Picnic tables & parking available. Bring a blanket – come to dance and root for your favorite. P2 (Stamford), Avid Rox (Walton), Hello, Seattle (Oneonta), Atlas Arrows (Binghamton), Nuclear Fusion (Stamford), Private Drive (Bovina/NYC), and The Mutton Chop 5 (Cooperstown). Free Admission – Picnic & Music – It can only be FUN. Putting this event together (in just three months) we’ve experienced the rewards of local entrepreneurship! Our communities may exist miles apart, but they are connected by people who embrace the challenge of redefining ‘possible’, especially when it’s for the community! This event celebrates the entrepreneurship, the expertise, and the compassionate spirit of many people from different communities who’ve come together as one with the desire to create a musical venue for younger musicians. 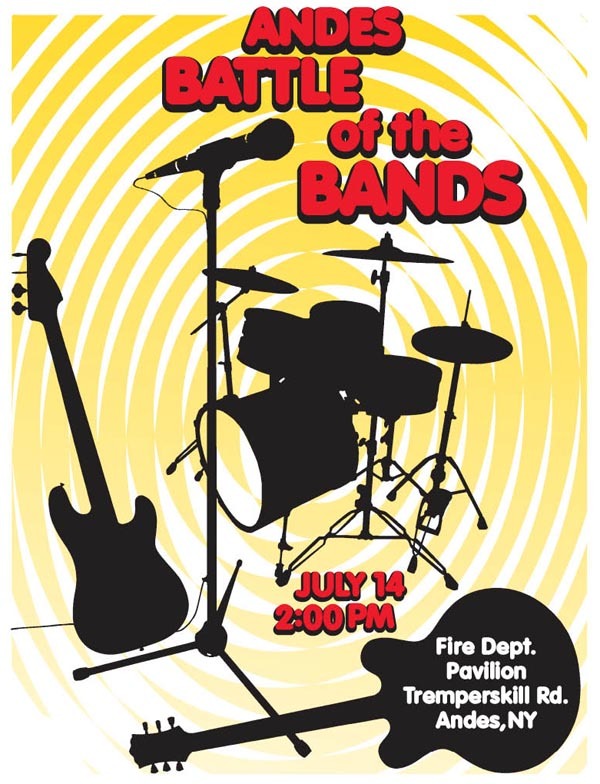 Inspired by Andes Fire Chief Joe Berghammer who wanted young people to have their own event this summer, the Andes ‘Battle of the Bands’ is sponsored by The Andes Fire Department and Auxiliary, WIOX Radio, Andes Works!, Kevin Prior Carpentry, and with support from The MARK Project. This entry was posted in Amazing People, Andes, Community, Events, Fun, Tourism and tagged andes ny, bands, dance, family fun, Free Event, Music, rock music, thash metal music, WIOX Radio. Bookmark the permalink.